So, what can you expect on game store shelves? Well, more zombies, to begin with. 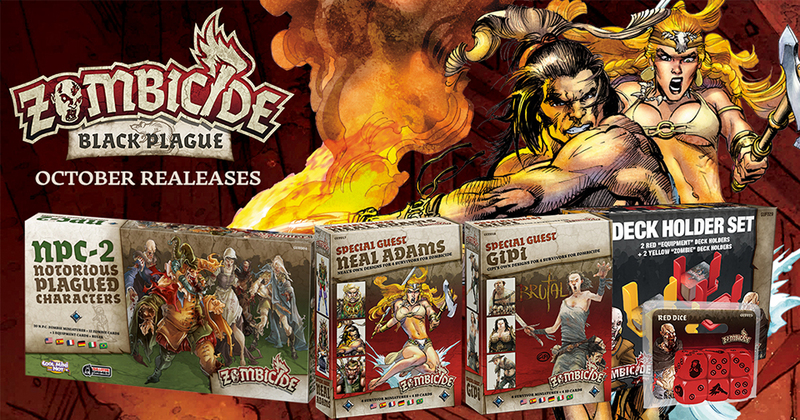 The Notorious Plagued Characters (NPC #2) box gives you 20 new zombies to invade your tabletop. And if you've got new zombies, it seems only right that you get some new survivors, too. There's two new Guest Artist boxes coming. One's from Neal Adams while the other is from Gipi. All those heroes and zombies are going to require dice. Good things those are going to be available, too. Finally, trying to keep all your card decks stacked nicely during a game can be a bit tricky. Thankfully, there's new deck-holders coming as well to make sure cards don't end up all over everywhere in the middle of a game. These will be available this Friday at game shops near you.